North Star Cruises has unveiled a busy calendar of events aimed at giving guests a unique experience on board the ultra-luxury True North adventure cruise ship. Guests can learn about landscape painting, enjoy classical guitar performances, gain a deeper understanding of ancient rock art, and learn more about Kimberley geology. North Star General Manager Peter Trembath said 2010 was the "Year of the Special Guest". 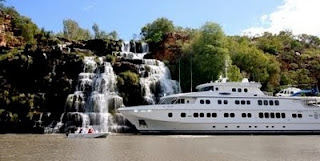 "We are providing some excellent value-add bonuses for guests who book a Kimberley Wilderness cruise," said Mr Trembath. "Interacting with some unique characters and specialists guides within the stunning Kimberley environment provides guests with an experience they will never forget." A sundeck, forward observation lounge, ship's lounge, alfresco bar, internet café, plasma screens with interpretive information, lower deck dining room with large panoramic windows, and fine dining. · All cabins feature enhanced décor, en-suite facilities, in-house entertainment and satellite telephones. · Multiple expedition boats allow passengers to do "what they want, when they want". · The True North is the only Kimberley adventure-cruise ship that sails with its own helicopter. · The purpose built True North is able to explore the upper reaches of shallow river systems. · Adventure cruises and expeditions operate along the magnificent coastlines of Australia and the South Pacific.